Screaming Reels Rod really screaming! Here is a nice brown caught by our good friend and customer Bob Williams. 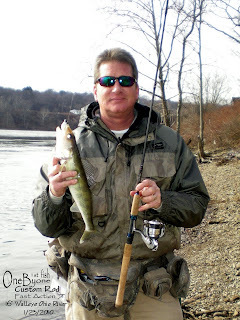 Bob is the owner of Screaming Reels Guide Service and he really knows how to catch fish. Check out his web site at http://www.screamingreels.net/ . The rod in this photo is a 11' 7wt. Sage with a split diamond closed cross wrap and screaming reels thread weave. Click on the photo to see the detail of the thread wrap. The lower photo is a monster steelhead that is trying to eat the rod! You can see the weave on that one.Thanks for the pictures Bob! Keep the reels screaming! 1st fish with new rod! 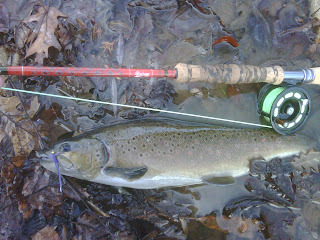 Here is a pic of one of our customers with his first fish on his new one by one rod. Thanks for the photo Jeff! Here are a few rods that we are working on right now. We made some changes to some rods at our customers request. We changed out the stripping guides on 3 different sage rods and reshaped the handles to better fit the customer. On the z-axis we replaced the real seat and handle with a custom turned grip. Check them out. Here are a few rods that we did in 2009. We hope to see pictures of the fish caught with them soon! OneByOne Rods wants to wish everyone a happy New Year!! One filled with lots of time on the water, big fish, and great memories. 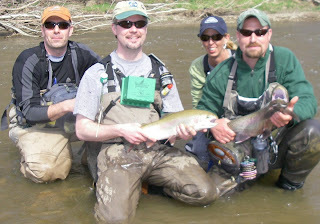 We are very excited about 2010 and are looking forward to meeting alot of new friends and catching alot of great fish! Look for us this year at the Pittsburgh Outdoors show and Trout Unlimited's Cabin Fever, this spring! !